February has been all Abe, all the time. Believe me, I’m not complaining. I love playing this great man. He is such a role model for all ages. 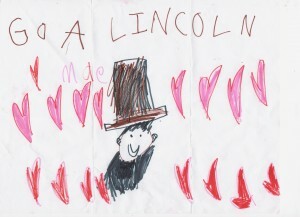 A perfect example was after a recent show when a kindergarten aged girl handed me a drawing she did of Abe as the audience was applauding. Her teacher came up to me and said. “She is only 5 years old but is madly in love with Abraham Lincoln.” I posed with the little girl for a photo and was so moved by how taken she was with my “persona”. It was actually touching, to tell you the truth. 10 minutes later, one of the ladies (in her 70’s) who works in the cafeteria came running up to me and shouted, “I need to give you a hug, Abe!” Like I said, Abe is an all ages crowd pleaser. To slip in to his skin every now and then is an honor and a privilege I don’t ever take for granted.